October 28th, 2009 by M. Clark. I play my main squash at a Bristol based squash club "Bristal Lawn Tennis and Squash Club". Currently I am looking to improve my coaching skills and have some new students, tennis players who may start playing some squash when the tennis is rained off. 1. The grip: Hold your squash racket as though you are "shaking hands with it". 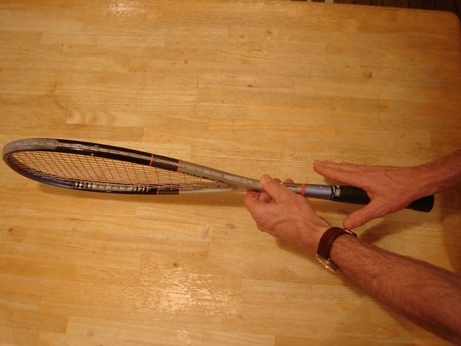 The V of your thumb should align with the inner edge of the racket. Make sure you hold the racket with your fingers, so that your fingers are well spread. It's actually your 3rd thinger that does most the gripping. Best to ask your squash coach to show you. It's quite hard to describe in writing! You should play the ball with an open face - meaning that striking side of the racket should be facing slightly upwards. Again ask to be shown. 2. The Preparation: The squash racket must be "up" very early. The ball will come at your quite quickly. 3. Body Shape: Backhand or forehand, address and play the ball with your shoulders facing the sidewall. Backhand - strike the ball just infront you leading leg, Forehand - strike the ball just past the leading leg. Fitness - squash can have long rallies, mis-hit shots just hit the walls, and the rally can keep going. Speed - your fast footwork in short bursts to cover the court will help your speed on the tennis court. Watching - you have to watch the ball even more so as your opponent prepares and then hits it, which will really help you watch the larger tennis ball during your main sport! Same as in tennis - watch the ball onto your racket. Slice - squash will help a tennis player develop a Roger Federer/Andy Murray slice shot. This is part of the grip above, but you can also get used to playing a ball that's past you to get out of trouble. Racketball: It could be better to play the sport of Racketball...it's similar to squash, but shorter rackets and a larger bouncier ball. The rallies are longer, and the ball is easier to warm up. The theory is the same as squash. If anyone has anything to add, please send in your information.